Mini BagLock is an affordable, tamper evident, pull tight, bag security seal. Ideally suited to the sealing of clinical and sensitive waste bags, it is now available in a side tear off (tool free release) version. Custom printing available with text and numbering. Standard colours - Red, Yellow, Blue, Green. 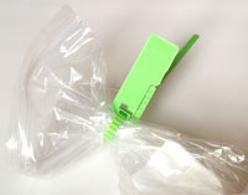 Clinical waste bag security seals. Sensitive waste bag security seals. security seals for cable/wiring looms.